Also an article on the history of Yorkshire Dales knitting. ‘Yarn Forward’ have done us proud with the lovely layout and choice of images to go with the article. After the article was written and the pattern finished, the magazine wanted more pictures so we went up to Wensleydale and Malhamdale for the day. 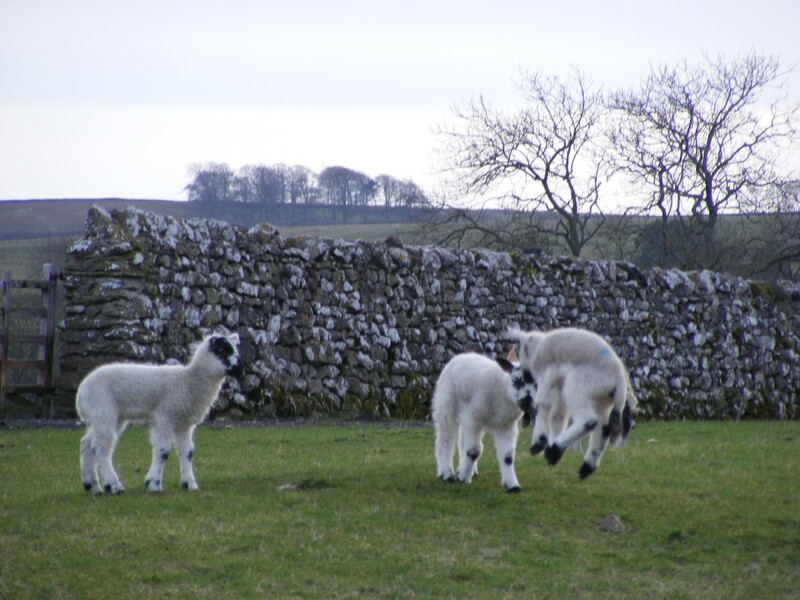 We visited the Wensleydale Longwool Sheepshop. A very kind Raveller gave us permission to knock on her farm door, whilst she was at work, and ask her bemused family to let us photo the sheep, then lambing in the barn, not far from Hawes. This was last month – in the scramble to get everything together for the article, I didn’t post on my blog. As you can see, these do not have the adders’ back (lightning) pattern the whole way round but a ‘Midge and Fly’ on the palms. One pair appeared to be silk, too (They ‘read’ as wool in photos). The knitting is considerably finer than my pattern and the lightning itself not solid. The real refinement (and something I found impossible to replicate going up in tension and needle size) is the way the solid vertical lines between the lightning patterns end precisely at the intersections between fingers – something I couldn’t copy without going down in yarn grist and needle size – and I decided modern day knitters wouldn’t ‘wear’ that idea! This is the trouble: it’s a fine line between dumbing down patterns for perfectly capable contemporary knitters, thereby patronising them – and making it accessible enough to catch the interest of people, and be an instant gratification knit that even new knitters might attempt. Knitting a glove is a great introduction to knitting in the round and I was conscious of that, too. I’m not sure whether I hit that right or not. I will definitely come back and work out the pattern for a precise copy of some of the Hawes gloves. Why? Because I can! And because maybe the 19thC re-enactors out there might find it useful! My other big design decision was going with DK not 4 ply yarn. (I used yarn from the Wensleydale Longwool Sheepshop, near Leyburn – spun from the Wensleydales in the fields round the shop!) When I figure out a pattern of a repro pair, will probably handspin but the Wensleydale DK was good for purpose as it was not only locally sourced but had all the qualities the original yarns had – as lustrous as silk, and worsted spun so very good for showing off the subtleties of two colour knitting. 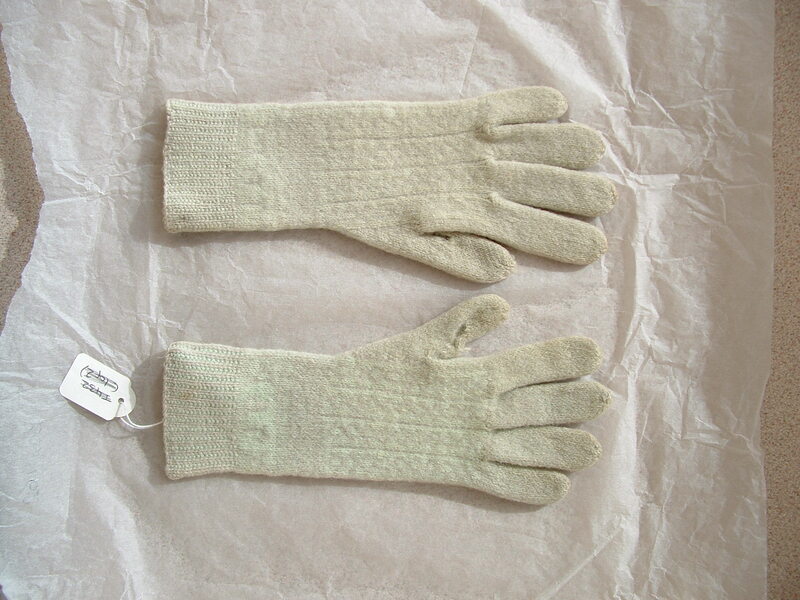 I was lucky enough to see two pairs of the Hawes gloves at a recent exhibition at the Castle Museum in York, at Easter – actually out of display cases, so it was fascinating to see them close up. They are fine, beautiful and practical pieces of knitting. What I like best though is the way they are so personal to someone’s history – with dates and intials knit in to the deep wrist cuffs. Colours faded but look carefully, you can just make out the pattern. I wonder whether they were dyed in the 1860s at the very start of chemical dyeing, with unstable dyes – or earlier than that, a fading vegetal dye? Natural dyes are reliable and fast as a rule. Even with the colour gone, you can see this is a refined piece of knitting. "Your Darlings You See Never"
From the 1879 History of Tazewell County, Charles C. Chapman & Co. Quoted in Martha McDonald’s “Roodhouse Family Tree”, 2002. This story concerns the son of one of my mariner relatives – my first cousin 5 times removed (twice over!) one of the sons of Jane Roodhouse (above), by her first husband Captain Abraham Wood. I descend from the family both sides who decided to stay farming in Cawood, Yorkshire. Abraham Jr was born in Cawood, Yorkshire in and baptised on Jan 25th, 1818. He was a posthumous baby, his father having died a few months earlier. The burial record simply says Abraham Sr ‘drowned’. 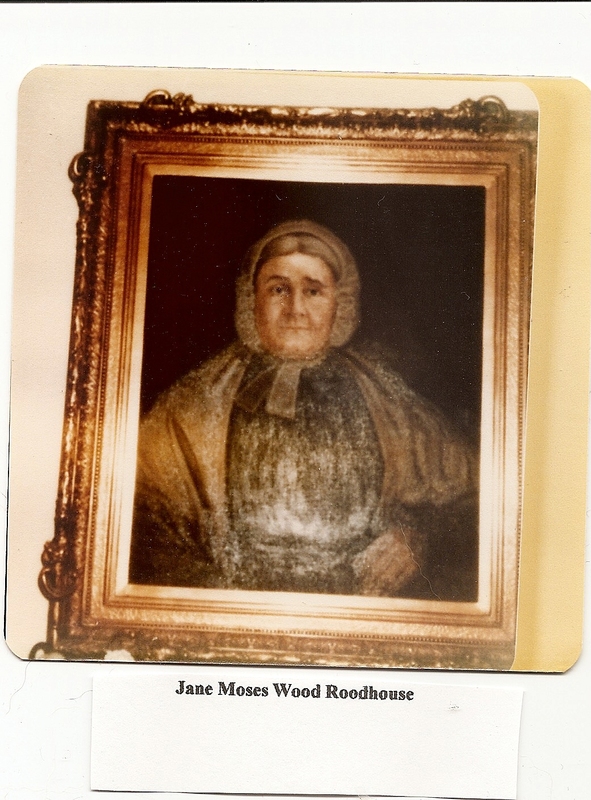 Jane went to to marry widower Ben Roodhouse, and together they emigrated to the U.S. I’m related to the Wood family as well as the Moses’s and the Roodhouses too (Ben’s sister was my great X 4 grandmother, Jane’s brother also in my direct line). It’s likely Abraham Sr was captain on ‘Ebiezzer’ or some other vessel owned by Jane’s father, Isaac Moses. In 1830, the 12 year old Abraham Wood Jr emigrated to Illinois with his mother and his stepfather, brothers and sisters. In later life, he changed his surname from ‘Wood’ to ‘Woods’. “The History of Tazewell County” describes how the county was plagued by horse thieves in the 19thC. It describes something that happened to Abraham in 1853. “…A very gentlemanly appearing man stopped at his house for dinner. He was sociable, agreeable in conversation, and withal, a clever fellow. He claimed to have plenty of money, and said he was on his way to California. He left, and a few days thereafter, appeared and called for breakfast, remarking as he entered, ‘Treat a dog well and he is sure to return.’ He was such a fluent talker, so intelligent and agreeable, that Mr. W. was glad to see him. He soon left. Mr. W., observed that he had a sharp eye, that could not be caught for an instant. On coming to the house that morning, he passed the barn and looked at two spans of fine horses, a gray and a bay team. He expressed much admiration for the grays, and made enquiries about their gentleness, &c . Mr W. replied that they were his ‘darlings’, and were perfect pets. The myths around traditional knitting are worth exploring. One new one seems to be the idea that Tudor, even medieval, sailors or fishermen wore a forerunner of the gansey. 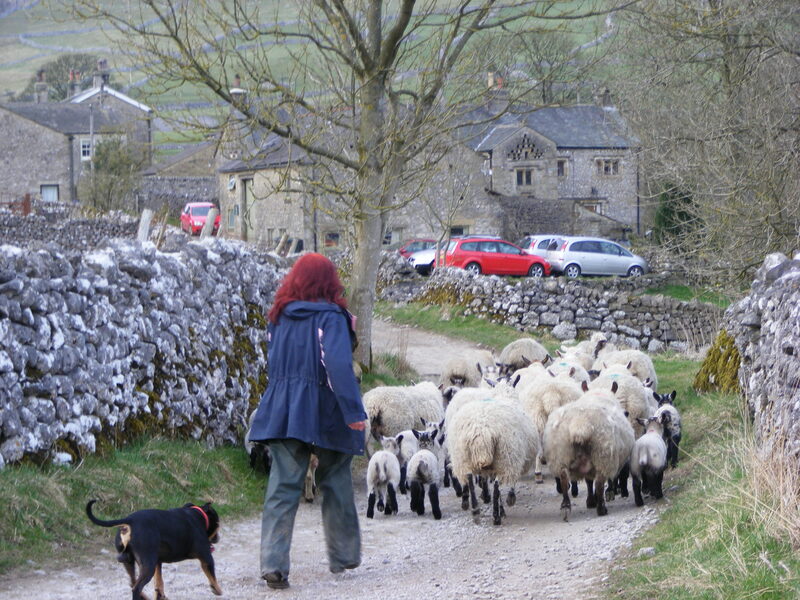 I’m going to explode a few myths in a forthcoming book, so should keep my powder dry – but here’s a few thoughts and woolgatherings that are accruing alongside the tumbleweed that is generally between my ears. And no, they didn’t. And here I am 30 years on still having this dialogue. The danger with reconstructing historical costume is – we have the benefit of hindsight. The trouble is, we expect clothes to perform and to be weatherproof. Fishermen in the past? They didn’t need a gansey to be equivalent to Superman’s high tech outfit. They wanted waterproof… the put an oilskin over it. There is a danger with all the myths flying around, we’re turning the gansey into some super-garment that it never was. It’d be great if it was this paragon of wind-cheating, water-turning, preternatural super-powers. But what we see as ‘great’ is again, with the benefit of 20/20 vision in hindsight. If they had jumpers in the 17thC – so by inference, earlier than that date, too – there’d be at least one scrap of evidence for them. Somewhere. Not an entire garment maybe but a hard to ascribe fragment of knitting. A portrait. A reference in one, just one of the millions of Wills and Probate Inventories. I’ve read many hundreds of these on Microfilm, even coming from these villages along the river here, where there were always fishermen. Nope. No such thing as a 16thC, 17thC or even 18thC jumper. Nil. Zero. Zilch. Pas un sausage. And I don’t think there’s any evidence whatsoever for knitting in England prior to the 1460s. No hard evidence. Which means – no evidence. Which is not the same as saying – no jumpers. But as good as. OK…Certain things it would be nice to find. It would confirm what we like to think. But the hard truth is, you can only reconstruct what is provably there. And we can look at the entire period of history right up til the 15thC to say, we can’t prove knitting was even here in these islands. Post that kind of date, it was done here but only specific items of clothing – caps, hose, scoggers (sleeves), and at the high end, ecclesastical adornments like fancy silk and metal thread cushions. No jumpers. Alright, what about the archaeology then? Let’s find some hard evidence of knitting in England prior to the 1460s. Look at the textiles found in digs. Let’s look here. In the anaerobic muck of York. Wheer there’s muck there’s brass . And maybe some fragmentary textiles. I bet if they knitted jumpers in Viking times, say – there’d be fragments of knitted fabric. Let’s see if there are. I have in front of me ‘Anglo-Scandinavian Finds From Lloyds Bank, Pavement, and Other Sites’ (Arthur McGregor, Council for British Archaeology, 1982). 32 fragments of textile were found at the Anglo Scandinavian levels of the Lloyds Bank site due to our “exceptional soil conditions”; 13 pieces of textile from 5, Coppergate and 21 more from Lloyds Bank in 1974. Most textiles from this period survive on the back of metal artefacts in graves. Many of the fragments were light brown, sophisticated twills, remarkably like those found at Birka. The twills vary in sophistication but let’s just say we know the vikings had weaving down to a fine art. Witness the silk coif in The Yorkshire Museum. Two of the fragments were fine worsted (wools) and one, mulberry silk. It is thought that they have “professional homogeneity” (ie: look manufactured). All the fabrics are woven. No knitting. Fragments of fabric survive – even when comparatively discrete sites are dug. No fragments of knitting, though. 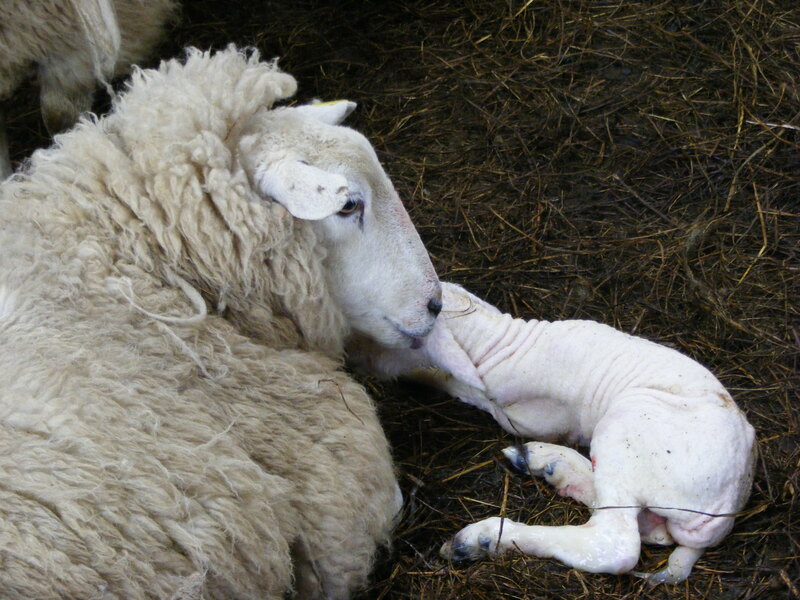 Given that the wool used to knit with is identical chemically to the wool used to weave with – had large, knitted upper body garments existed – we’d have a square inch of one. We have a sprang Roman stocking, after all. The fabrics from 5, Coppergate were also broadly the same kind of thing – “woolly medium coarse repp twill”. . Woven. There was also a piece of plain woven golden coloured silk. I venture so far back as a thousand years to prove that fragments of textile can and do survive in our mud. It has been said they would be as rare as ‘finding a Rolls Royce’ in the mud. Tell that to the archaeologists who found this, equivalent to maybe a fleet of Rollers a few miles from here. In the mud. How about going into medieval times, now? Let’s sample the mud for the later period. How about a quick look at ‘Craft, Industry and Everyday Life: Finds From Medieval York’, [YAT, pub. Council for British Archaeology, 2002, Patrick Ottaway and Nicola Rogers]. We turn to the Textile Production section, written by the foremost expert, Penelope Walton Rogers. This book has a very useful summary of the hard evidence for the introduction of knitting to England. Why? Because amongst the finds, were 3 copper alloy rods, two of 2.6mm and one of 1.9mm diameter. They have been designated ‘knitting needles’ but no-one’s entirely sure what they are. The two larger ones were found in the floor of 2, Aldwark. 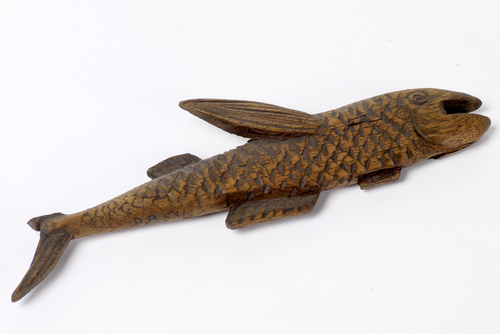 The other one which is thought to be post-medieval, was found at the Foundary site. At first that looks like an early date – but in all probability, the needles were deposited at some later date. Not everything found on the floor of a lost building, is contemporaneous with the day that building was raised. 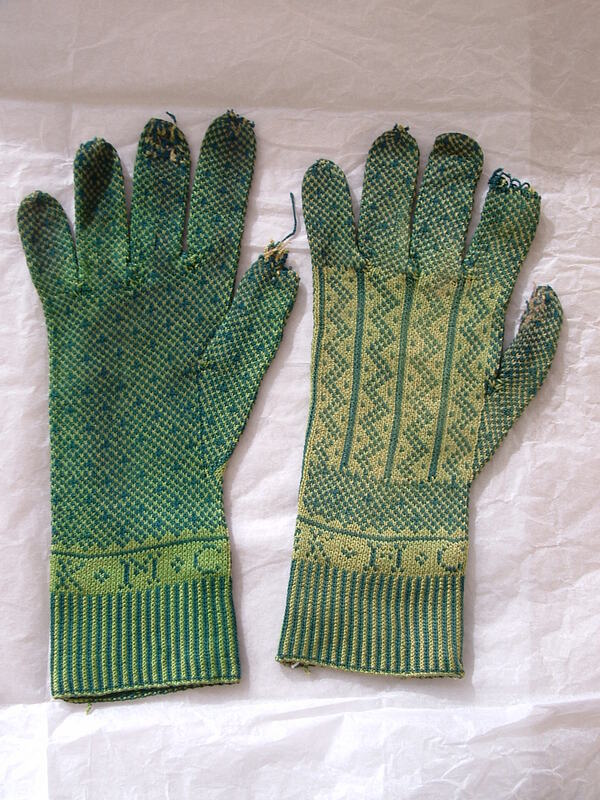 The earliest samples of knitting in England are of a similar date – late 14thC. London, and early 15thC Newcastle. Penelope Walton Rogers points out both are port towns and, for this kind of date, “there are records of knitted garments being imported in Italian galleys...” She cites Crowfoot. Analysis of the Newcastle fragment did indeed prove it to be not English at all – but using woo and a dye from Southern Europe. Penelope Walton Rogers cites Kirsty Buckland’s citation of the City of the Ripon Chapter Acts for the first HARD evidence of an English knitter – one Marjory Clayton of Ripon, referred to as ‘cappeknitter’ in 1465. Until that date, there is no hard evidence for knitting. No doubt it existed. But the earliest evidence we have is 1465 and that is for a cap knitter. Which is in line with everything else we know about the history of knitting in England – caps, hose, and ecclesiastical fripperies came first. We have sumptuary laws for this kind of date and no mention of a knitted body garment ever appears in 15thC sumptuary laws. Again – had jumpers or something analogous existed – we’d find documentary evidence of it even if we lacked archaeological/ visual arts recording it. And as you can see, we have no reason to lack the archaeological samples. Old textile fragments survive. Tellingly, almost as soon as we get the first reference to a knitter here, the references start to come thick and fast – knitting spread fast as references to cap knitters and hose knitters start to appear. Yorkshire was always at the centre of this industry, so no surprise maybe the first reference to it is from here and that within 100 years or so of Marjory Clayton, references to it become numerous. All of those references, however, are to caps, hats, hose, and later, petticoats. Which is in line with the archaeological finds. Had something like a jumper existed – there would be one painting showing it, one woodcut, one find, and – easiest of all these things to find – a myriad of written sources referring to it. We have port records of imports and exports. We have personal journals. We have estate records – often detailing things like the selling of a wool clip, getting things woven up/dyed by journeymen, etc. We have, of course, the literary sources. I remember seeing the Concordances for Shakespeare’s works alone in my University stacks. They were vast. Let alone all the surviving other literary stuff – endless writers but not one reference. Something we do find in the muck with monotonous regularity are spindle whorls. These can be hard to date. But most of those in my collection are, broadly speaking, ‘medieval’ or not a lot post medieval (the exceptions being some Roman ones and 17thC Bellarmine ones). Years ago we weighed a random sample of them, well over 100. Many of them had provenances if not dates and came from all over England – London as well as here in the North East and pretty well everywhere inbetween. They had a surprising consistency – around 1oz in weight. To knit a gansey you need worsted spun wool, not woollen spun. This is made from long, fine fibres (the best of which were only developed post 1750 – another argument for no ganseys prior to Industrial/Agrarian Revolution dates!) You also need a minimum of 3 plies to make it more perfectly circular in cross section, so giving you the crisp stitch defintition. No point in elaborate patterns from fuzzy wool! 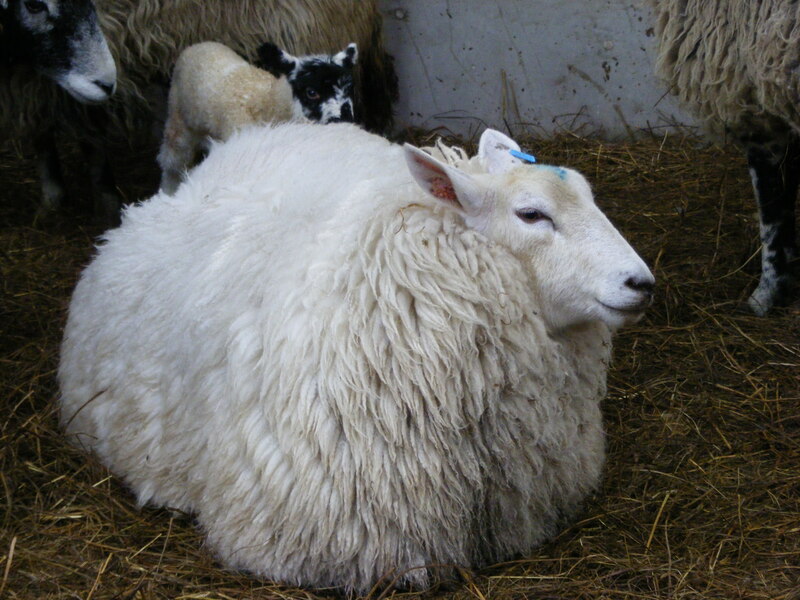 Of course longwools existed prior to this date – Cotswold, for example, was developed from a Roman type of sheep. But ever tried to ply on a spindle? Ever tried to 3 ply or more on a spindle? (Pre Navajo plying which was only known in England in the 20thC). 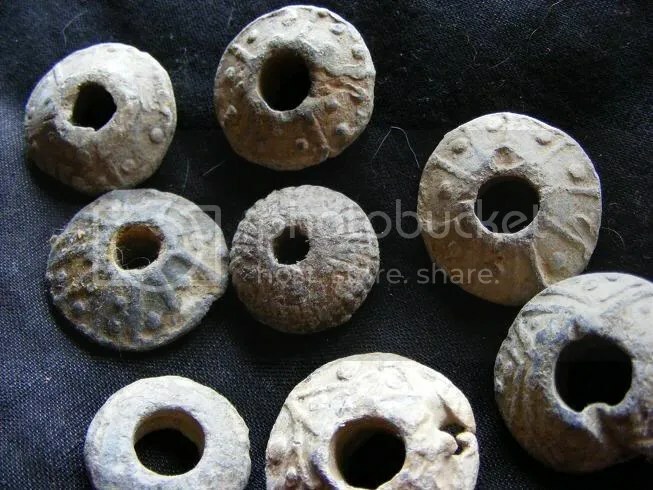 You’d quickly realise that you’d need a wider variety of whorl weights if you were making ‘gansey’ style yarn at a time in history when we only had spindles. We don’t see that variety. 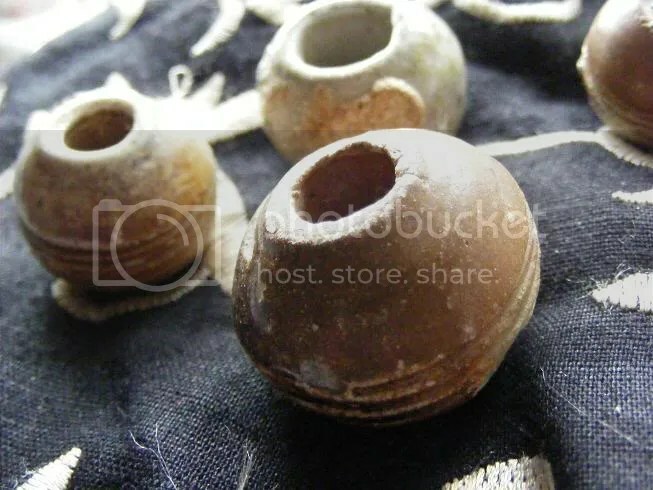 17thC Bellarmine spindle whorls, from PH's collection. Back to those 3 putative ‘knitting needles’ in York…. That still leaves us with what are possibly knitting needles in a late 14thC context, but no proof of knitting for another 60 years or so. And all of that of course, leaves us with no ganseys/jumpers/knit frocks, call em what you will. (These needles are the equivalent in size to standard sock needles, so look like they’d most likely be used for hosiery – and finer caps, possibly. All the textile fragments from medieval York are of woven, not knitted, cloth. There is no evidence for a sleeved upper body garment til the 17thC knitted silk damask undershirts (that’s vests) for adults, and the child’s vest from the 17thC in the Museum of London I think it is. And no evidence that undergarment migrated to becoming an outer garment til the 19thC. The liklihood being, therefore, it made that transition – in England – at some point in the 18thC. There are high status knitted silk waistcoats from the 18thC. No jumpers. And no record of them as a woolly, lower status garment, even here in the fishing community along the river for any 18thC date. 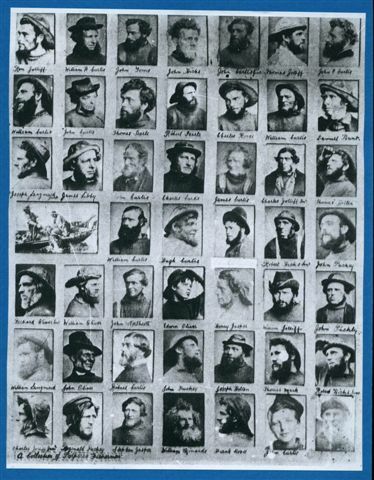 The lovely Polperro Press allowed us to use some of these iconic photos in an article in Yarn Forward 18, last year – Harding’s images thought to be the first ever of ganseys – taken by Lewis Harding in Polperro, Cornwall, around 1850. Mary Wright’s classic little book, Cornish Guernseys & Knitfrocks is back in print, thanks to them. Well worth buying for you gansey fans! The earliest printed pattern for a gansey is as late as the 1880s. A survey of the 19thC newspapers picks up nothing for ‘knit shirt’ or ‘knitted shirt’, but a few references for ‘knit frock’ concentrated around the 1850s onwards, and that word yields to ‘gansey’ by around the 1870s. Curiously, the word gansey even then often appears in inverted commas, as if they thought it was a vulgar word. The gansey is very firmly post Industrial Revolution – the crisp stitch definition etc only an option once most gansey worsted can be machine spun and, post 1860, chemically dyed, if necessary. It is a product of the mechanised age even when it is handmade, so sadly, no spinning ladies in the picturesque doorways of cottages with roses round them. It’s an occupational costume, maybe ground out as often by Dales contract knitters doing generic garments, as made by loved ones for loved ones. It cannot predate the 18thC and very likely does not predate say the 1790s. By the time Lewis Harding took the first photos of ganseys in Polperro, Cornwall in 1850 – it is clearly an evolved art. But that’s an evolution that may only have taken one or two generations. So whilst it would be lovely to give the Leicester Lads their fantasy and say yes there were Tudor/17thC jumpers – hard truth is – sorry lads. There just weren’t. To see images of earlier knitting, look at the V & A Collection, here. Museum of London Collections here. 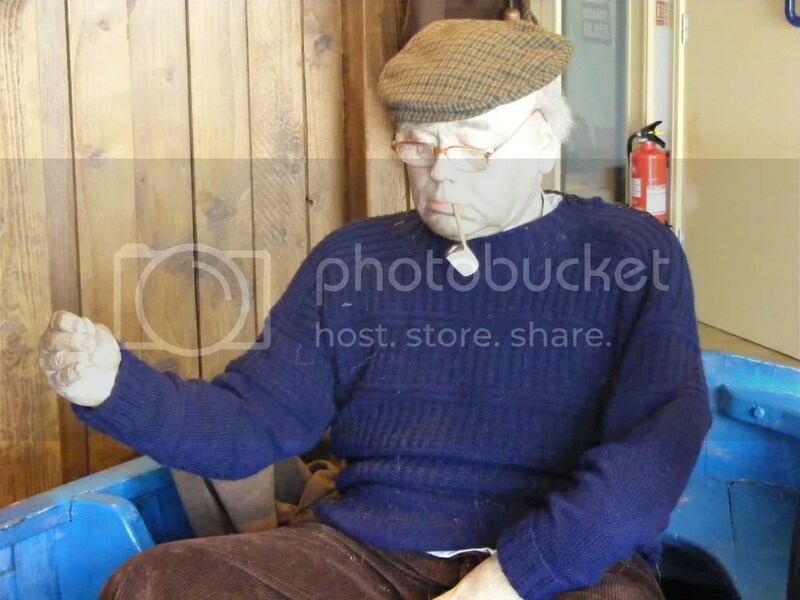 Shetland Museum (Gunnister and others) here. Also, some old links but maybe you’ll find something here.